Sitting up on a hillside in the shadow of Monte Subasio between Assisi and Foligno, the pink stoned Spello is a perfect example of one of Umbria’s medieval small towns. Spello was settled under the Umbri, but grew in size under the Romans in the 1st century BC when it was known as Hispellum. Among it’s Umbrian neighbors, Spello is one which preserves the major number of monuments testifying to the Roman era. Most obvious are the town walls, the ruins of the theater and the amphitheater seen just outside of town, the thermal baths, and the splendid town portals Porta Consolare, Porta Urbica and Porta Venere dating back to the Augustean era. Spello also boasts one of Umbria’s major art attractions, the outstanding frescoes by Pinturicchio in the church of Santa Maria Maggiore. How To Get To Spello – Regular trains run from Foligno and Perugia and there are up to nine buses that stop in Spello on the Assisi – Foligno run. A car park is located immediately after Sant’Andrea and there is a second one off Via Cimitero by Porta Montanara. What To See In Spello – Santa Maria Maggiore is thought to be built over an ancient temple dedicated to Juno and Vesta. The façade has a Romanesque portal and a 13th century bell tower, while the pilasters next to the apse have frescoes by Perugino (1512). The most striking feature is however a very fine chapel (Cappella Bella) frescoed by Pinturicchio. The Umbrian artist was called to paint these frescoes in 1500 by Troilo Baglioni. The fresco cycle include the Annunciation, the Nativity and the Dispute with the Doctors, plus four Sibyls in the vault. The Palazzo dei Canonici, annexed to the church, houses the Town’s Art Gallery, The Pinacoteca Civica. One of the finest pieces inside are a wooden statue the Madonna and Child, an Umbrian work dating back to the end of the 12th century. Also shown is a statue of the crucified Christ. The Palazzo Comunale Vecchio, or “Old Town Hall”, which contains the Library and Town Archive, was built in 1270 and then enlarged after the end of the Baglioni seigniory, in 1567-1575. It too has some frescoed halls, with one attributed to the Zuccari brothers. It is faced by a 16th century fountain. Along Via Garibaldi you will come across Palazzo Cruciali, built in the early 17th century, the seat of the town council, and then San Lorenzo from the 12th century. San Bernardino da Siena began his preaching season in this church in 1438. Palazzo Baglioni, erected as a fortificated mansion around 1359. The Governor’s Hall has frescoes from the 16th century. Sant’Andrea lies a short distance uphill from the Pinacoteca and boasts a simple 13th century facade. The interior, on a single nave, has 14th century frescoes. There’s also a panel by Pinturicchio, named Madonna and Child with saints. Along nearby Via Torri di Properzio one comes across Porta Venere, a Roman gateway flanked by two towers and one of the best remnants of Roman Spello. The twin towers flanking the gate might be either Roman or medieval. Porta dell’Arce is one of the oldest entrances to Spello and is a great example of how the Romans integrated their buildings into their fortifications. Close by, one can see across to Assisi’s Santa Maria deli Angeli from the Belvedere. From the belvedere, you can descend down to San Claudio, an elegant example of Romanesque architecture with a rose window on the asymmetrical façade. The church itself dates back to the 12th century, while the interior has 14th century votive frescoes from the Umbrian school. San Claudio is said to have been built on the remains of a Paleo-Christian cemetery. In the plain, near San Claudio, are the remains of a semi-excavated Roman Amphitheatre which was built below the medieval town. 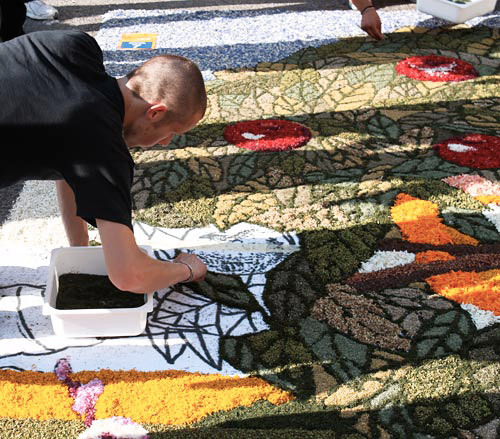 The Infiorata includes a whole night of work for the Corpus Domini feast when the streets are “painted” in artworks with flower petals.